The Celtic cross is a symbol that combines a cross with a ring surrounding the intersection. It belongs to a kind of crosses with a nimbus. The history of this powerful symbol is ambiguous. There are many variations of interpretations and legends about the original meaning that are commonly repeated even today. The Presbyterian and Catholic are often startled to learn that the other considers this symbol their own. In our modern multicultural world the ringed cross is as much a symbol of ethnic heritage as it is of faith and it is often used as an emblem of one’s Irish, Scottish or Welsh identity. In Ireland, it is a popular legend that the Celtic Christian cross was introduced by Saint Patrick when preaching to some soon-to-be converted heathens was shown a sacred standing stone that was marked with a circle that was symbolic of the moon goddess. Patrick made the mark of a Latin cross through the circle and blessed the stone making the first Celtic Cross. This legend implies that the Saint was willing to make ideas and practices that were formerly Druid into Christian ideas and practices. This is consistent with the belief that he converted and ordained many Druids to lives as Christian priests. These and many other stories and beliefs are the sort of folk lore history that cannot be substantiated by the academic convention of looking back into the written record for early citations or for iconographic precedence that contains enough supporting evidence of what the artist is really trying to say. What we have from the modern scholars and archeologists about Celtic art from early times are careful descriptions and comparisons. 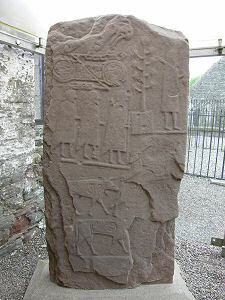 There are in Britain stone monuments that may be the ancestor of the Celtic Cross. The Chi-Rho symbol, the monogram of Christ was a commonly used symbol of Christianity in the 4th century Roman Empire. The Emperor Constantine who made Christianity the official religion of the Roman Empire used as his emblem the Chi-Rho in a laurel wreath. 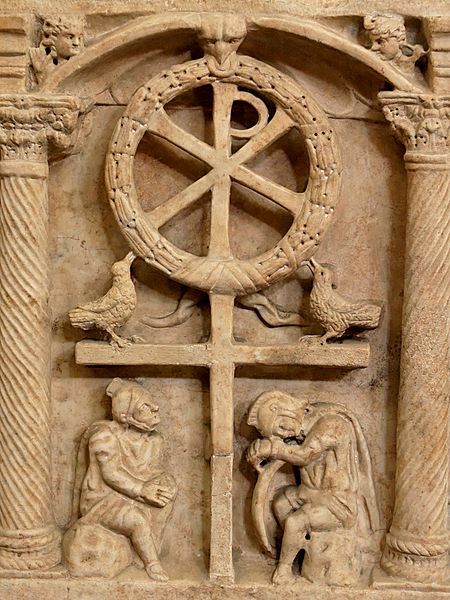 Thus combined was the pagan Imperial symbol of Rome with a symbol of the new faith. The diagonal cross members of the Chi were eventually conventionalized to a single horizontal cross member that made its cross with the vertical stem of the Rho and the wreath was conventionalized into a simple circle. There are examples of this where the loop of the Rho is also conventionalized into a shepherd’s crook. One can easily see how the curved crook of the staff could disappear to leave just a cross in a circle as is common in many Welsh crosses of the early Celtic Christian period which followed the Roman withdrawal from Britain. The carvings fall into several categories, with several or all of these present on any example. Human figures representing Biblical stories or the crucifixion offer the most obvious meaning. Endless knotwork, spirals, meanders and "key patterns" and zoomorphic animal patterns make up the majority of early cross carving subjects. These are the same elements that are used in much the same way in metalwork and in Gospel illumination. The term insular is used to describe this style. There are many regional variations. The Iona group crosses are distinctive in their shape. 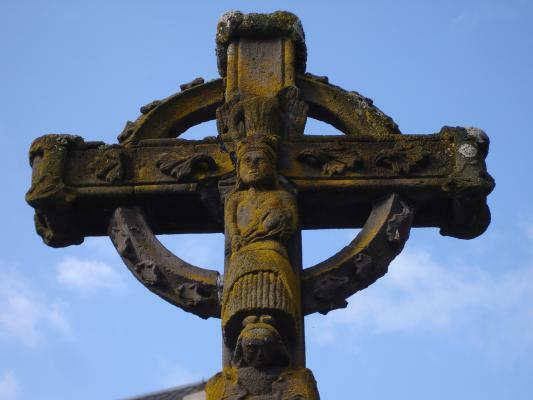 Many of the Irish High crosses of the 10th century are capped with a pitched roof or "house cap" that are similar to reliquaries made to resemble a Celtic oratory. 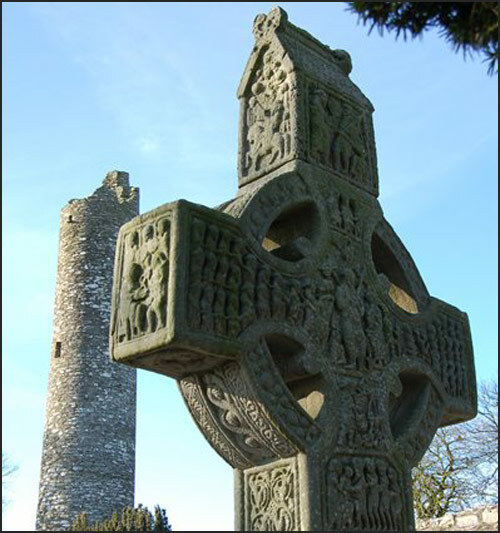 On several crosses, notably the Cross of Muiredach at Monasterboice (shown above) and the Cross of the Scriptures at Clonmanois, both in Ireland Christ is enthroned in Glory at the center of the cross. The stone monuments can be attributed to specific places since they rarely were moved more than short distances. What may have been carved in wood, ivory or embroidered has been lost to us. Surviving work from earlier than the 10th century in those materials are extremely rare. St. Adomnán writing in the 7th century reports that there were several hundred wooden crosses on Iona, but none survive today. There are similar crosses in France, which some specialists think are influenced by those from Ireland. But the correct expression to define the continental crosses is "cross with nimbus" (croix nimbée in French). Their design is different, but all the French examples are quite analogous in shape to each other. They are found mainly in the western part of France, in Normandy, Britanny and Limousin as far as Auvergne in the center. Most of them were made around the 15th century. 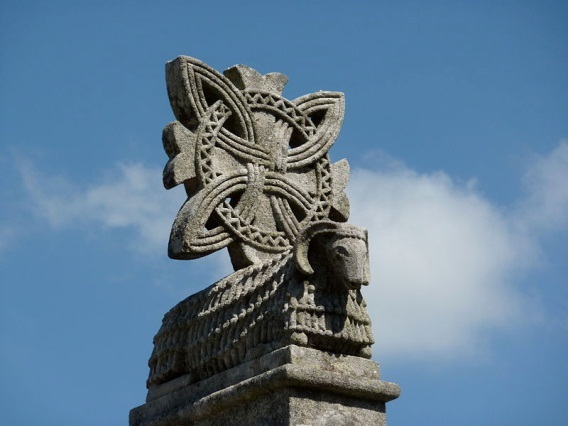 In Galicia Celtic crosses are usually found atop horreos (granaries) as a protective measure against any kind of evil. They can also be found atop churches, and since the beginning of the 20th century in cemeteries, but they are unusual in cruceiros (high crosses). A very characteristic Galician style combines a Celtic cross with a Celtic simple knot. 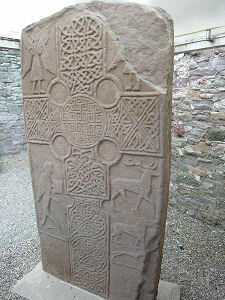 It is similar to the St Maur cross at Glanfeuil Abbey that could have been made between the 9th and the 11th century. The Celtic Revival of the mid-19th century led to an increased use and creation of Celtic crosses in Ireland. In 1853 casts of several historical high crosses were exhibited to interested crowds at the Dublin Industrial Exhibition. New versions of the high cross were designed as fashionable cemetery monuments in Victorian Dublin in the 1860s. From Dublin the revival spread to the rest of the country and beyond. Since the Celtic Revival, the ringed cross became an emblem of Celtic identity, in addition to its more traditional religious symbolism. 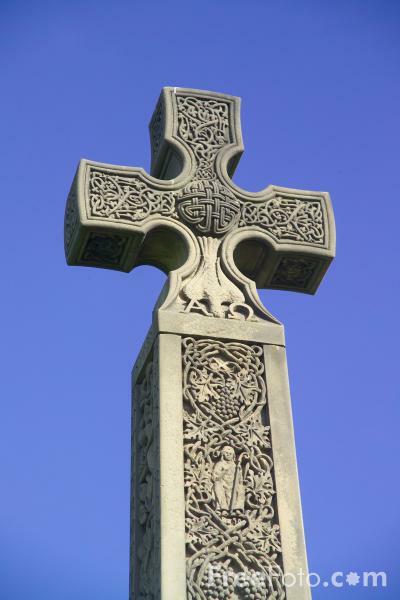 Since its revival in the 1850s, the Celtic cross has been used extensively as grave markers. This was a departure from medieval usage, when the symbol was more typically used for a public monument. The Celtic cross now appears in jewelry, T-shirts, tattoos, coffee cups and other retail items.